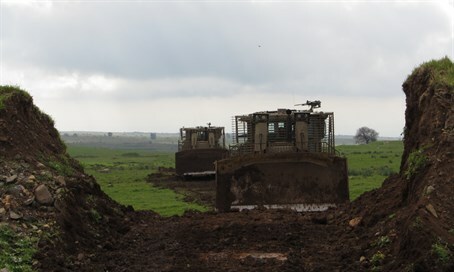 IDF D9 armored bulldozer rolls over an explosive planted by terrorists at the security fence, escapes blast unscathed. An IDF Caterpillar D9 armored bulldozer drove over an explosive planted by terrorists adjacent to the Gaza security fence Friday morning - but, miraculously, the vehicle and its occupants emerged unscathed from the blast. The incident took place during routine operations at the fence in the Sdot Negev Regional Council area, adjacent to the northern area of Gaza. The explosive was planted just west of the security fence, in the security perimeter area where Gazans are forbidden from approaching the fence. Even though the heavy machinery rolled directly over the explosive, no one was wounded in the incident and no damage was caused to the bulldozer by the explosion. Gazan terrorists have often sought to booby trap the security fence area, and during campaigns inside Gaza as well they have used explosives to target Israeli tanks and heavy machinery. Those hidden explosives have often inflicted a heavy toll, making the lack of damage on Friday all the more remarkable. Friday morning's incident comes after IDF forces overnight arrested six wanted terror suspects in Judea and Samaria. Three of those arrested were suspected of being involved in terror activities and violent breaches of public order targeting civilians and security forces. In Khan Abu Salman, located adjacent to Kalkilya in northeast Jerusalem, a Hamas terrorist was arrested. Four of those arrested were nabbed in Al Aroub near Bethlehem in Judea, including a Hamas terrorist. And in Saeer, near Hevron, another Hamas terrorist was arrested. All six suspects were transferred to investigation by security forces.